This project's objective is to convert the drivetrain on the Dahon MuEX from 2x10 speed to 1x11 speed. The most challenging part of this project is to install the 11 speed 11-32T cassette onto the 10 speed freehub body of the Kinetix Pro wheelset. With that successfully done, it is now possible to continue this project. 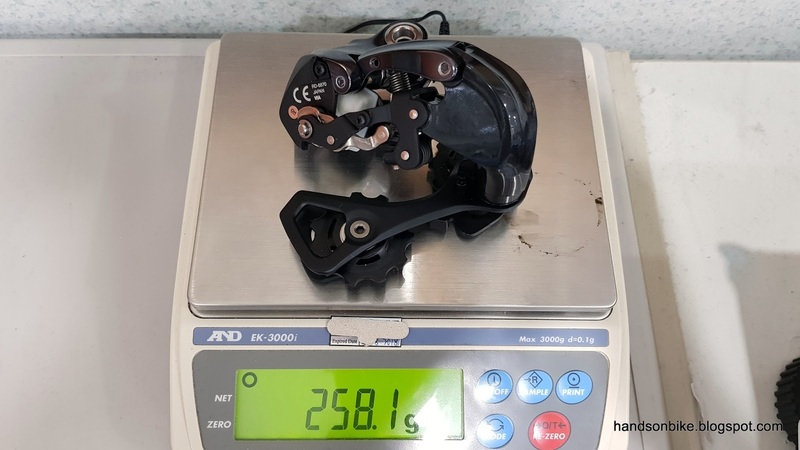 As the rear cassette gets upgraded from 10 to 11 speed, the Di2 rear derailleur also needs to be upgraded to match the same number of speeds. Unfortunately the rear derailleur cannot be simply reprogrammed to work for 11 speeds, therefore a change is necessary. The current 10 speed Ultegra Di2 RD-6770 will be replaced with the newer 11 speed Ultegra Di2 RD-6870 from the Canyon Endurace. This Ultegra Di2 RD-6870 is the mid cage version, as it was chosen to be compatible with the 11-32T cassette. The more common short cage version can only work properly up to 28T sprockets. Not only is the cage length different, the design of the linkage and other parts are also slightly different. This is to account for the different cassette shape as it moves from the smallest 11T to the largest 28T or 32T sprocket. As shown below, most parts are the same, but the Plate Member is different which affects the guide pulley position and movement. 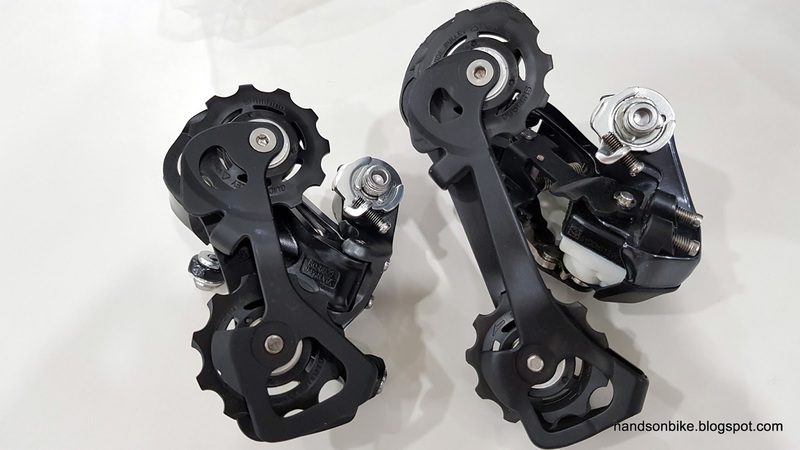 In other words, if you use a short cage version for a 11-32T cassette, or a mid cage version for a close ratio cassette (such as 11-25T), shifting performance may be compromised. 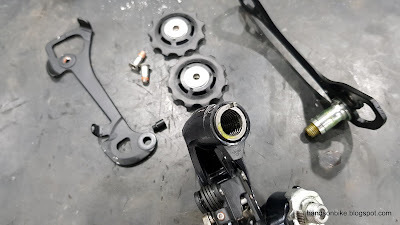 If you have a 11-28T sprocket, I think either the short or mid cage version will be OK.
As for the longer cage on the mid cage version, it is longer because it needs more chain slack capacity, as the chain difference is greater on a 11-32T cassette than on a 11-28T or smaller cassette. On the stock Canyon Endurace, the front crankset is 52/36T while the cassette is 11-32T. 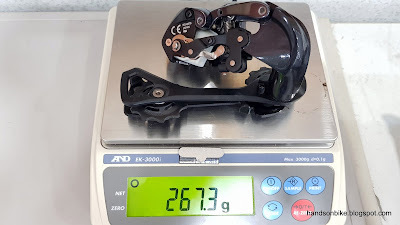 Using the formula above, the chain capacity required would be (52 - 36) + (32 - 11) = 37T, exactly the maximum that the mid cage rear derailleur can support. Ultegra Di2 RD-6870-GS, which is the mid cage version. This is different from the short cage version which I had previously. The mid cage version has a longer cage to increase the chain capacity, allowing it to be used on a drivetrain with a larger difference between the smallest and biggest gears. 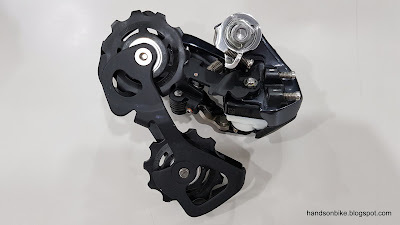 At this point, we have verified that the mid cage rear derailleur is suitable for use with the 11-32T cassette. If they are both installed on the Dahon MuEX, they will work fine, and I can move on to the other components. However, are there any other issues, and is there any room for improvement? One main problem of using mid or long cage rear derailleurs on small wheeled bikes is the decreased ground clearance and tire clearance. Due to the smaller wheels, the rear derailleur cage will be closer to the ground and also the tire. There is usually no issue with ground clearance, as you will not be taking the small wheeled bike off-road onto uneven ground. On flat ground there is no issue with ground clearance, even when going over humps. However, tire clearance can be an issue, especially if you have wider tires, such as the Schwalbe Kojak. When the rear derailleur is shifted to the lowest gear, it is close to the spokes and also the tire. From my previous experience on modifying small wheeled bikes, using a road mid cage rear derailleur on 20" wheels with wide tires will leave quite a small clearance between the cage and tire. It will still work with no interference, but it gets a bit too close for my comfort. On a normal drivetrain with a front double crankset, the mid cage is necessary to provide sufficient chain capacity. However, since this will be a front single 1x11 speed drivetrain, the front chainring will always be the same size as there is no front shifting. If the front chainring is fixed at a certain size, the chain capacity thus depends solely on the rear cassette size. 32T (max) - 11T (min) = 21T. Only 21T of chain capacity is required if a front single chainring is used, which can be satisfied even with a super short cage (which does not exist). 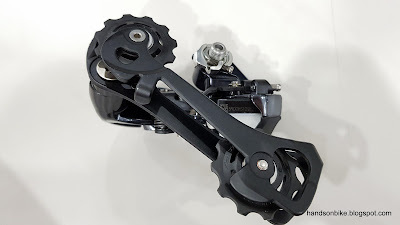 In other words, a rear derailleur with a short cage will have sufficient capacity to satisfy a front single setup. In this case, if I take the mid cage RD-6870, and change just the cage to a short cage, I will get a rear derailleur that is compatible with the 11-32T cassette but with reduced chain capacity. This is not a problem for this front single drivetrain, but the advantage is that I get more ground and tire clearance, while it is also a little more lightweight. Which rear derailleur cage is compatible? From the exploded view diagrams of the RD-6870, you can see what parts are interchangeable or compatible. Exploded view of the Ultegra Di2 RD-6870. This only shows the user replaceable parts, which are mainly the components of the cage. 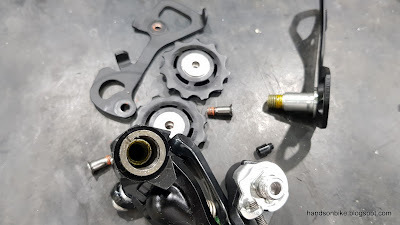 From this table, I found that the cage set components (inner and outer plate) are basically interchangeable with the mechanical Ultegra RD-6800 rear derailleur. 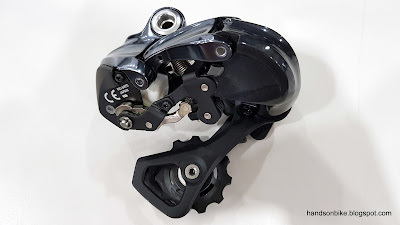 Therefore, I will need to cannibalize a short cage from the mechanical Ultegra rear derailleur, RD-6800. 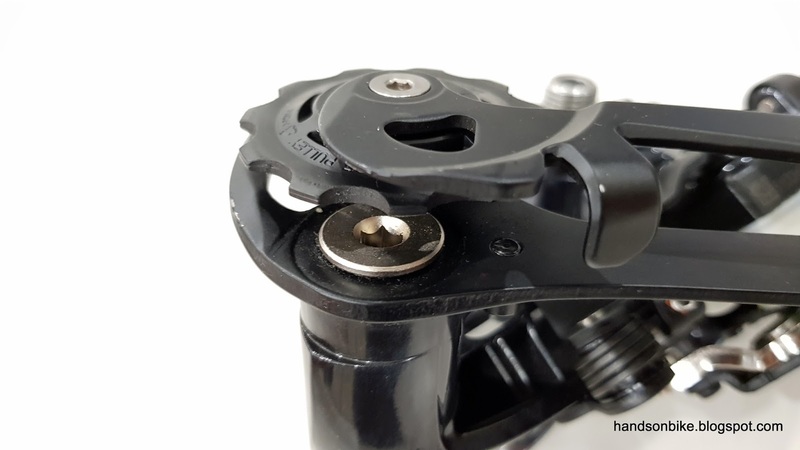 If you prefer, you can order spare parts from Shimano, and buy just the short cage set. However, this is more troublesome and you have no idea how long this part will take to arrive. Short cage mechanical RD-6800 on the left, mid cage Di2 RD-6870 on the right. The idea is to move the short cage over. To swap the cage set, the bolt shown here needs to be removed to detach the cage set. Before that, the guide pulley needs to be removed to access this bolt. Before dismantling the mid cage Ultegra Di2 RD-6870, it is weighed for reference. About 268 grams with the mid cage. As the cage parts are compatible and similar, it is a straightforward swap. With this modification, I get a short cage Di2 RD-6870 that is capable of shifting well even up to a 11-32T cassette. The other combination (mechanical RD-6800 with higher chain capacity, but is only compatible up to 11-28T cassette) is not that useful, although it can still be used normally, just with a longer-than-necessary cage. Special edition Ultegra Di2 RD-6870 with a hybrid of mid cage design and short cage capacity. After changing to the short cage, this rear derailleur now weighs about 10 grams less at 258 grams. The objective of going through all this hassle is to get a short cage version of the Ultegra Di2 RD-6870 that can shift well up to the large 32T sprocket. It will have better tire and ground clearance when installed on the 20" Dahon MuEX folding bike. 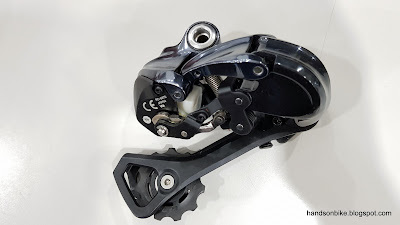 After completing the modification of the 11 speed 11-32T cassette, followed by this special edition rear derailleur, the next step is to convert the Ultegra crankset to a front single crankset.